It’s science fiction, it’s an action RPG, it stars a strong female protagonist, and it rocks. If I were to describe Transistor in a nutshell, those are the words I would use — but the game deserves way more praise than that. We’ll start with the good. Or rather, the great. The soundtrack in Transistor was so well-received, that it’s often the first part of the game people mention. 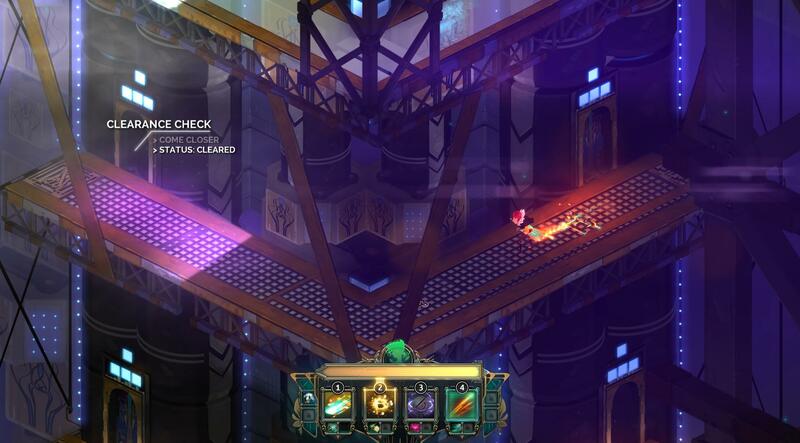 Darren Korb, the audio director for Supergiant Games, who also worked on the equally successful soundtrack for Bastion, described the genre of music as being “electronic, post-rock, old world.” It’s a strange blend of synthetic sounds, guitars, drums, and vocals. 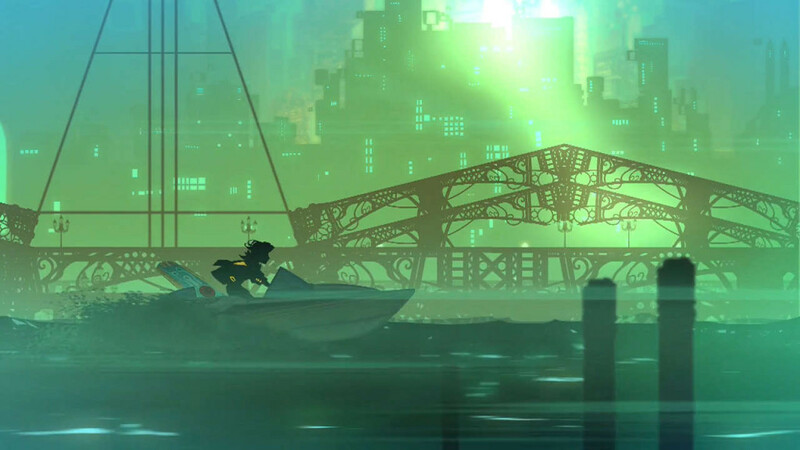 The music serves as an integral part of the atmosphere in the Transistor world, a city called “Cloudbank.” Combined together with beautiful graphics, the music does an amazing job of fully immersing the player into the game. An interesting point to note is that the few songs that actually have vocals, sung by Ashley Barrett, also serve as important parts of the plot. In the game, the character you play is a woman named Red, who was previously a singer before her voice was stolen from her. During crucial parts of the game you’ll hear songs with a female singer in them who is alluded to be Red herself, adding a strange sense of blurred reality when you consider that the songs you’re listening to are ones written and sung by a fictional character. It’s rare to encounter a game that uses the soundtrack as part of the narrative, but Transistor made the right choice by doing so. Many people, myself included, bought the soundtrack along with the game and can’t say they’ve regretted it at all. But the positives of Transistor don’t stop there. When it comes to visuals, Transistor looks absolutely stunning. From the strong use of colors that are bright but not obnoxious, to the beautiful design of the buildings and streets of the city itself, Transistor is a game that proves eye candy can come from more than just a AAA title on the Unreal engine. It’s rare to find a game where everywhere you go, you can stop and take a screenshot and have it be an amazing wallpaper for your desktop, but Transistor is just that. Everything about the graphics is clean and crisp, which is surprising of a game that obviously draws its influences from high-technology and computer parts, a style commonly known as “Cyberpunk.” Cyberpunk art is not known for its variety of color or clean looking landscape (actually it’s known for quite the opposite), yet Transistor manages to reject everything that makes Cyberpunk what it is, while still fitting under the umbrella. Every character has a unique design and color scheme that makes them stand out from the rest, except for the enemies. The enemy design is plain, white, and angular. However, this is wholly intentional. The main enemy in Transistor is known as The Process. They are essentially a slew of varying kinds of white robots with red eyes who make it their mission to erase the entire city and turn it into a clean, white metropolis. The stark contrast of color and white space makes The Process and their corruptive influence feel like a true antagonist, especially in the later parts of the game where you’re entirely surrounded by white as you head towards the center of the chaos. There is no doubt whatsoever that the art is one of the selling points of this game. This is where the positives somewhat slow down, though. 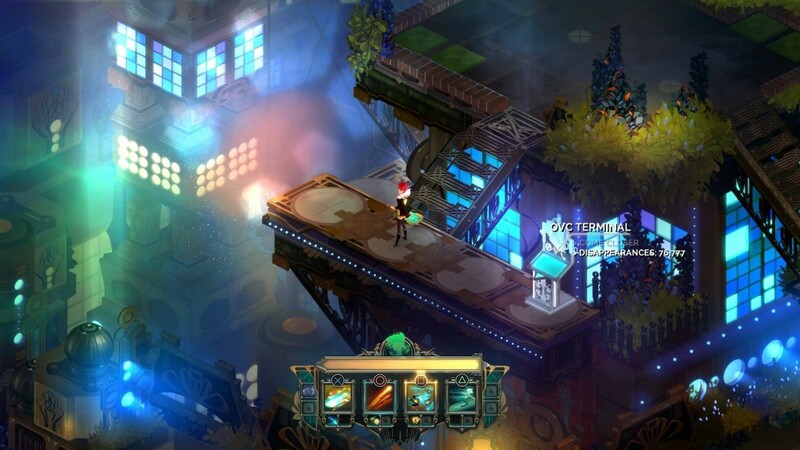 The story is a part of Transistor that gets a lot of fans talking. When you create a game with a persistent narrator in a beautiful and interesting world it’s going to get the story-driven people (such as myself) really curious about what’s going on. Why is there a guy trapped in a sword? Why are there people being turned into data? How is it that a bunch of robots can just erase the landscape and what’s making them do it? Transistor provides a lot of answers, but they’re not satisfactory. Throughout most of the game you’re given tidbits of information until the end. 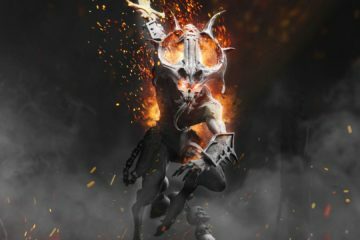 The final boss fight and all the scenes leading up to it give you a ton of answers, but start making you question several more things, and before you know it, the game ends. It was a very frustrating ending on its own, but coupled with the vagueness of the story you’re just left feeling slightly cheated. There’s a certain type of risk that writers take when deciding to leave certain questions open-ended at the close of a story. In Transistor’s case, it feels more like the writer had a really cool and interesting idea that was never fully fleshed out. Although there are many fan-made videos and articles written to explain their take on what it was that happened, it seems like no one will never get an official explanation on what the real answers may be. Therefore there are no real answers, only ones that you can come up with yourself. While there is a certain type of fun people can have with that kind of story, it’s still incredibly frustrating. “Turn()” is initiated by pressing the spacebar, which shifts the combat from action to strategy. Time freezes and you can plan wherever you want to move and whatever ability you want to cast, but with a gimmick. Each move you use and each step you take uses up space within “Turn()” mode and once you execute the plan, it takes several seconds for “Turn()” to recharge before you use it again. The real catch to this is that while you’re recharging you are locked out from using most of your abilities in real time. This can really hurt you if you end your “Turn()” in a spot that leaves you open to enemy counter attacks. Given the already small amount of health you have, what ends up happening is that combat consists of just activating “Turn(),” planning your moves, executing them, then running and hiding from the enemies that are left alive while your “Turn()” recharges. Then it’s just rinse and repeat until you win. Although you could theoretically not use “Turn(),” and just fight with your attacks, Red’s animations take so long, that later on in the game it’s just not practical to fight outside of “Turn().” What really saves the combat from becoming boring and tedious is the enemy design and the length of the battles. Every fight you have is relatively short, and you are constantly introduced to new enemies and new combinations of them too. 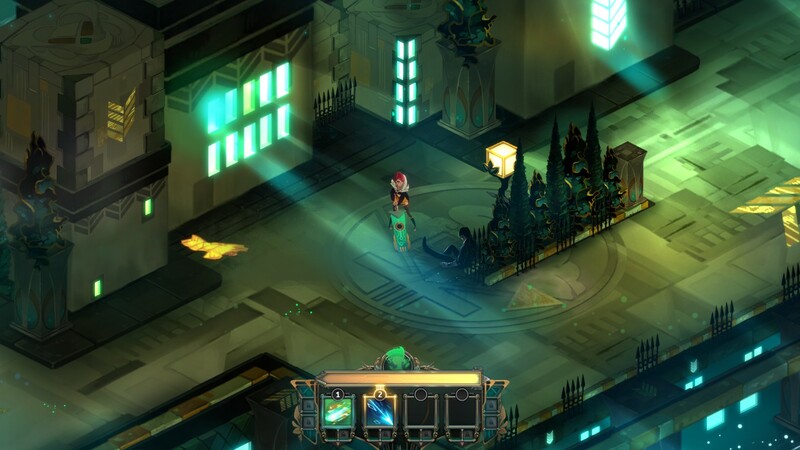 It seems though, that in trying to blend both strategy and action RPG together into one fighting system, Transistor falls short in both categories. It is action RPG-ish and strategy-ish, but not enough of one or the other to comfortably call it either. It’s just… Unique. However, because of the strong emphasis placed on how enemies work, you almost don’t notice how boring the combat can actually be until your second or third playthrough, especially since you are consistently slammed with challenging fights throughout nearly every moment of the game. This is a good time to mention that there is some amount of re-playability within Transistor. Beating the game once unlocks a New Game+ mode called Recursion, in which you get to keep your level and all your abilities with the caveat that the enemies are also kept as difficult as they were when you finished the game. This means your experience in the game won’t get any easier. There’s also a small plot teaser put in Recursion when you start it the first time that makes you wonder if the writers were intending to further the story with it. Alas, aside from a humorous and intentional “glitch” that happens during the “Turn()” tutorial, nothing else really happens. I would say that Recursion is really only for fans of the game, who want to play through it again with a greater challenge. You also get the option to continue into a new recursion after the second play through and to do so continuously until you’re satisfied, but Red does have a max level and there isn’t much to gain after the fact. Overall, despite my criticisms, Transistor is a game that is definitely worth your time. If you’re a person who loves an interesting story, amazing soundtrack, beautiful visuals, and cheap games (it’s only $20 on Steam) then there is no reason why you shouldn’t be playing this. After you beat it, you could even have some more fun and join the long and vast discussions about the game’s story on Reddit and YouTube, to name a few places. Or not, your choice! I have been Roderick and thank you for taking the time to read this review on BitCultures. Looking forward to writing more for you in the future! Until then stay cool, beautiful people. Next ArticleWho Should Use Kickstarter to Create New Games?